A powerful jet from a supermassive black hole is blasting a nearby galaxy in the system known as 3C321, according to new results from NASA. 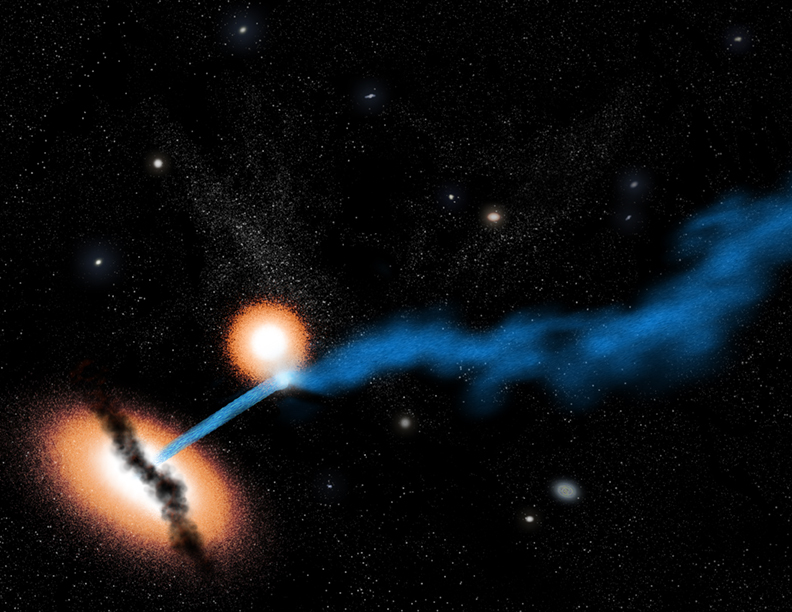 This galactic violence, never seen before, could have a profound effect on any planets in the path of the jet and trigger a burst of star formation in the wake of its destruction. 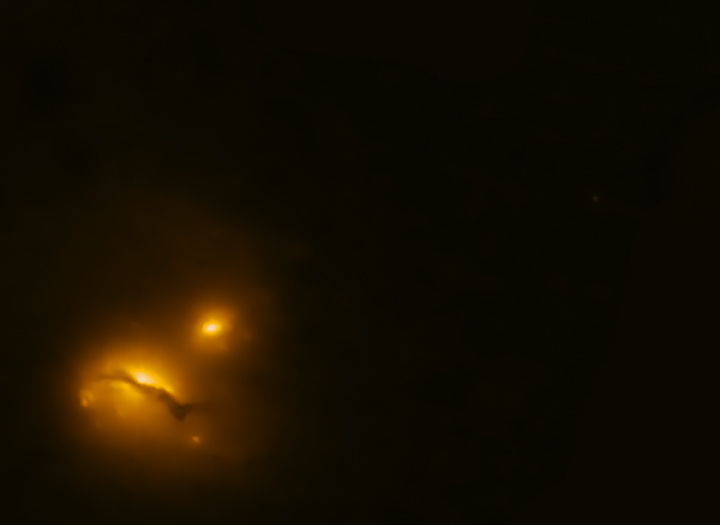 This composite image of the radio galaxy 3C321 shows the jet from a black hole at the center of the larger galaxy, to the lower left, striking the edge of a companion galaxy to the upper right, the first time such an interaction has been found. 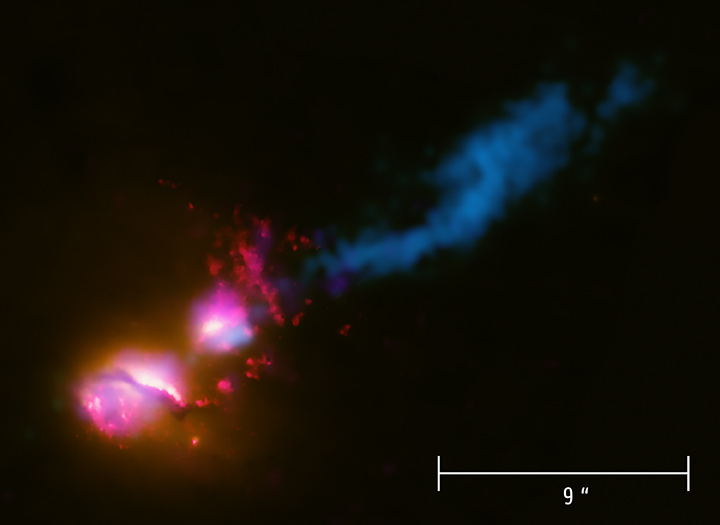 The image includes X-ray data from Chandra (colored purple), optical and ultraviolet (UV) data from Hubble (red and orange), and radio emission from the Very Large Array (VLA) and MERLIN (blue). A bright, blue spot in the VLA and MERLIN radio image shows where the jet has struck the side of the galaxy and dissipates some energy. The jet is disrupted and deflected by this impact with the companion galaxy. 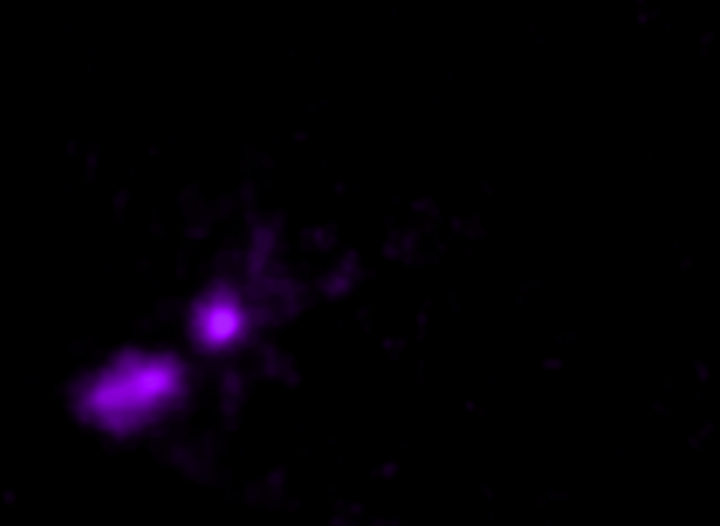 The Chandra X-ray image of 3C321 shows that both galaxies contain supermassive black holes undergoing a phase of rapid growth. It is unusual for two such active galaxies to be so close to each other. Hot gas in the galaxies is also visible in the image. 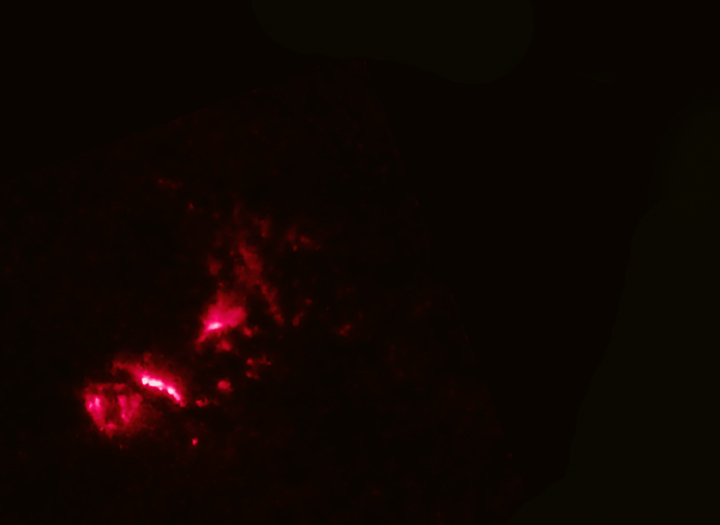 A bright spot in the VLA and MERLIN radio image shows where the jet from the larger galaxy in 3C321 has struck the side of its companion galaxy - about 20,000 light years away - dissipating some of its energy. The jet is then disrupted and deflected, much like how a stream of water from a hose will splay out after hitting a wall at an angle. This optical image from Hubble shows the glow from stars in the two galaxies in 3C321. A dust-lane is visible in the larger galaxy, showing that there must have been a merger with a smaller galaxy in the past. 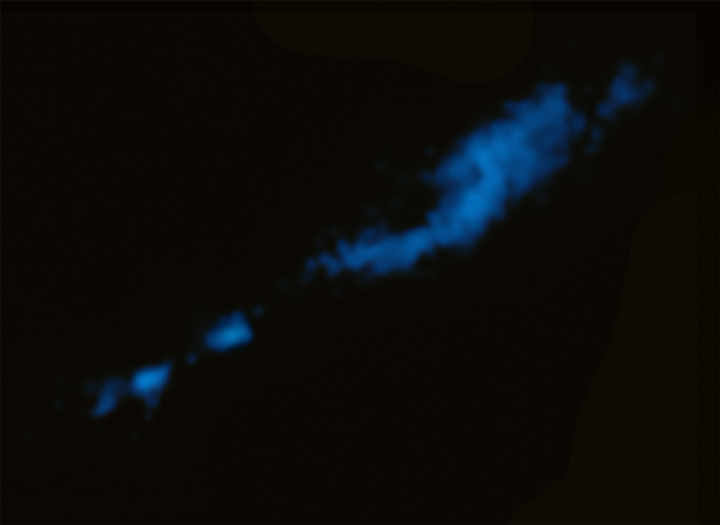 This ultraviolet image from Hubble shows large quantities of warm and hot gas in the vicinity of the galaxies in 3C321, indicating that the supermassive black holes in both galaxies have had a violent past. A wide-field view of X-ray and radio emission, the image reveals jets that extend for about 1.7 million light years before zooming into the central two galaxies. This artist's impression of 3C321 shows the main galaxy and the companion galaxy. A jet of particles generated by a supermassive black hole at the center of the main galaxy is striking the companion galaxy. The jet is disrupted and deflected by this impact. This images compares the composite image of 3C321 to an artist's illustration of the system, showing the main galaxy and the companion galaxy. 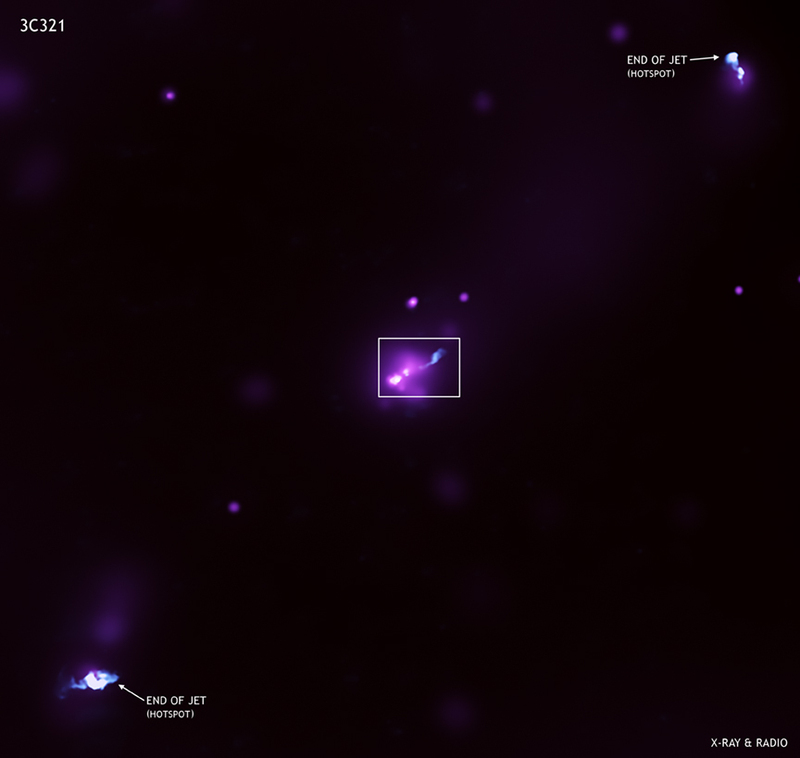 A jet of particles generated by a supermassive black hole at the center of the main galaxy is striking the companion galaxy. The jet is disrupted and deflected by this impact. The key features of this system are labeled in the final view.